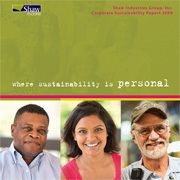 [Dalton] Shaw Industries released its second annual sustainability report. Titled, “Where Sustainability is Personal,” the 2009 report offers a perspective on the company’s comprehensive sustainability commitment, focusing on the personal commitment to environmental and social responsibility shared by each and every Shaw associate. It also discloses key metrics for environment and social responsibility, and provides an inside look at Shaw’s continued drive towards Sustainability through Innovation – the Shaw Green Edge.